The other week Sam got me a birthing ball online after a few recommendations from midwives, nurses and friends. When it arrived and Sam pumped it up we couldn’t help but laugh at how small and diddy it is. I mean, next to my birthday balloon and the pump it looks small, right? With only 3 weeks to go and spending the past 2 & 1/2 sick as a dying dodo with the worst cold I’ve ever had, I thought I need to step up my exercise game as I’ve been a bit of a hermit the past few weeks. Using a birthing ball has many benefits. It can help ease any back pain experienced during pregnancy and labour. It can help reduce the pain experienced during labour, reduce the pain of contractions, decrease anxiety and shorten the first stage of labour. Where can you buy a birthing ball? With 3 weeks left to go I’m already on the fed up path of being pregnant. My back aches, I can’t sleep at night, my bladder is fit to burst even when I don’t need to pee, I’m uncomfortable and getting up or off a couch/chair/bed is hurting my wrists and I’ve hit that wall. Now that I’m past the 37 week mark, Missy thankfully is considered as full term, so from here on out it’s generally encouraged that our babies arrive sooner rather than later. What’s the difference between a birthing and gym ball? They’re the same thing except one generally is bigger than the other and both are made of anti-burst materials. My ball is anti-burst and like most that you buy online, make sure yours is to, so that if they do deflate, they do it slowly rather than with a bang if it were punctured. Most are latex-free and made of PVC, but it’s worth checking out if you have an allergy before hand and do proper research before buying one. Birthing balls and gym balls are basically the same thing. Both can be made from anti-burst materials. This means they deflate slowly rather than with a bang if punctured. Make sure your ball is anti-burst, but keep sharp objects away from it, just in case. Don’t store it on rough surfaces or near heat like radiators, stoves and open fires. 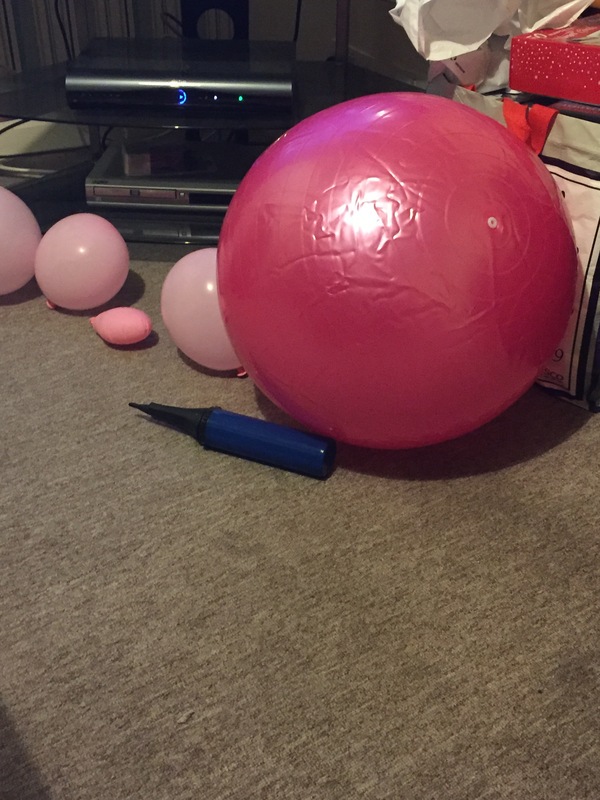 At this late stage doing much exercise out of your norm isn’t recommended so using the birthing ball amongst other techniques you’ve been doing can help you keep fit and healthy in your final weeks. I find it extremely difficult getting out of bed, not so much the rolling over, even though highly amusing for Sam, it is a lot of pressure on my wrists. Using the birthing ball whilst relaxing helps you get on and off the ball. If like me you’re on the laptop a lot, the ball helps your posture and also helps your body movement whilst sitting on the ball. It’s like a mini-workout for your body, keeping your posture in check which is good for labour and strengthening your muscles. Whilst you sit moving your bootie around on the ball, you’ll body will be getting a mini workout that helps your tummy muscles as well as your posture and balance. The ball, no matter it’s size can carry your weight and helps support your weight in your pregnancy, protecting your back and is a bonus with helping you get back in shape after pregnancy. Sitting on the ball and rocking your pelvis from side to side and front to back. When you do this, try to keep your shoulders still so the movement comes from your waist and below. Rotating your hips clockwise then anti-clockwise. Leaning over your ball from a kneeling position, then rocking your hips forward and back. If you’re overdue, sitting and rocking on your birth ball can help get your overdue baby to get moving, as the natural swaying motion of your lower body encourages your baby to get into a good position for birth. If you have any recommendations that you want to pass on, pop me an email. Previous Post What will be your labour day playlist?